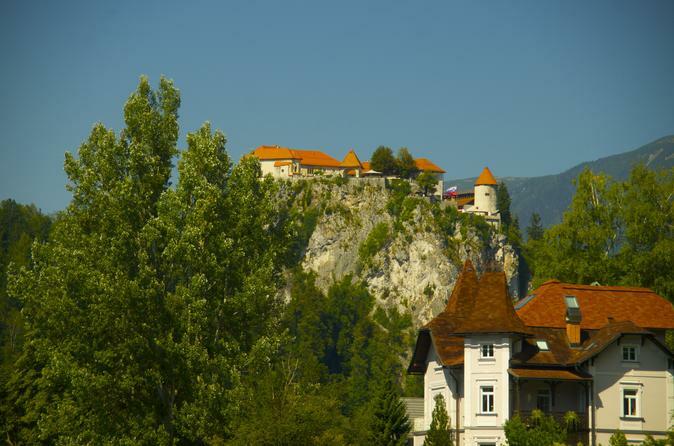 Explore Slovenia’s vast natural beauty on this Alpine day trip departing from Ljubljana. Join a small group and an expert guide and set off for the Alps, Lake Bled and Triglav National Park. Stroll Škofja Loka, a quaint old town in the countryside and many other cultural and natural points of interest. Group size is limited to eight people to ensure an intimate and personalized experience. Your adventure begins with a convenient pickup from your central Ljubljana hotel or other meeting point. After a brief introduction with your guide and fellow travelers, settle in to your comfortable minivan and set off for the journey to your first point of interest. Admire the views from your window as you travel into Slovenia’s green hillsides. First up: Lake Bled, an emerald lake surrounded by dramatic mountains. After a brief stroll, board an apletna (a Slovenian wooden boat) and journey to the tiny island in the center of the lake—Solvenian’s only island. Explore the island as your guide reveals its fascinating and quirky history, while pausing for photos along the way. After, it’s a quick drive to the Vintgar Gorge, a must see. This stunning canyon is known for its grand walls that rise 330 feet (100 meters) into the sky. Nearby you’ll discover Šum, a beautiful waterfall that drops 85 feet (26 meters). Enjoy lunch on your own (additional expense) before heading to Bohinj, Slovenia’s largest glacial lake. Take advantage of free time to rent a canoe (own expense) or to swim in the lake’s cerulean waters. Before the tour winds to a close, stop at the town of Škofja Loka, which has a fairytale castle and the oldest bridge in Central Europe. Take some time to explore the quaint town and take some photos as the sun begins to set. You tour ends back at the starting point. Very nice day tour! Beautiful landscape and great places to visit. Mini van arrived on time and was comfortable.Our tour guideNadja was very informative of her country and it's history, this she delivered with a smile and humour. Throughout the day there was no rush to move you on leaving us the time to enjoy our experience which gave us very enjoyable and loving experience of Slovenia. This was a fabulous trip and the guide was excellent . She made everyone feel comfortable and and gave us plenty of information about the places we visited. All aspects of the trip lived up to my expectations. I would recommend the trip to anyone. The whole experience was exceptional in every respect. We saw many interesting aspects of the alpine region- gorges, mountains, lakes,castles, old villages, countryside, community living, local farms. We covered a lot in one day. Our local guide was exceptional- friendly, informative, personal and obviously had a passion for his country. All in all a wonderful day in Slovenia. Can thoroughly recommend. This tour seems a bit unorganized in that we stopped at a village before going to two lakes and a gorge. The village doesn't seem to make sense with the theme of the rest of the trip. I would prefer to have more time at Lake Bled and skip the village the village was nice, but that wasn't my priority for this trip. However, Lake Bled and Lake Bohinj were so fantastic! Perfectly guided tour in beautiful nature area. Guide was very knowledgeable, scheduling had enough flexibility. Our tour was booked through Viator and it was with roundabout travel in Ljubljana, Slovenia. Our tour guide and driver was Jerry. It was a great day of viewing beautiful outer areas in the alpine region of Ljubljana. Transport was comfortable clean van which took a group of 8 of us. The guide Jerry gave us good information about Skofja Loka, Bled, Vingar Gorge, lake bohinjsko. Along with some facts about Slovenia, we had free time to see the small towns. Much easier to have a local quide you around rather than struggling on public transport or even hiring a car would have been awkward as school holidays currently and a lot of traffic. 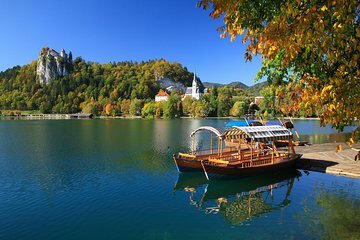 Price was good value but there are inclusions that you pay for such as the boat over to the island on lake bled and entrance to the gorge and they not mandatory that you do it but why would you go on a trip and then not see these couple of specular sights.